Yes, these are my shoes that I wore at my prom back in 2006! Stuart Weitzman makes not just fabulous shoes, but very durable shoes. These shoes will probably last me another six years. I have a few of these white hats, I recently found this one at a local thrift store here in town. My favorite type of hat to wear in the Fall & Winter. Hope you guys enjoy this little black & white number I put together for this post. I tend to always pick pieces that are black or white or black & white. I can't help it. I think both are so classy. 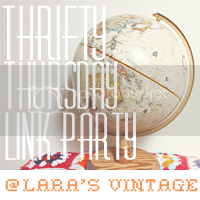 Please link up if you have a thrifty post that you'd like to share!! Until next time! Please join me for this week's Thrifty Thursday link up! My shirt was thrifted for $5 at City Wide Garage Sale in Austin, TX. I must admit that I don't own a vinyl by The Go-Go's but only because I haven't found one yet. I do have a few songs on my iPod but I have yet to find an album by these ladies, especially a greatest hits album (is there even one?). A pink, vintage tee is always a good idea, right?. I love pink, obviously. Just about everything that I am wearing is pink. Anyways, this tee is fun, fresh, bright & brings a bit of rock 'n roll. Until next time. "Bee" sure to follow me on Bloglovin' :) & link up!